These devices, offered in a thermally enhanced 8-pin SOIC package with an exposed metal back, are fully qualified for automotive use per requirements of AEC Q100. The IX4340NE is an automotive grade, AEC-Q100 qualified dual, high current, low side gate driver. Each of the two outputs is capable of sourcing and sinking 5A of peak current, and has a maximum voltage rating of 20V. The two outputs can be paralleled for higher current applications. 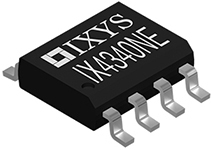 Fast propagation delay times (16ns typical) and fast rise and fall times (7ns) make the IX4340NE well suited for high frequency applications. The inputs are TTL and CMOS logic compatible, and there is an independent Enable function for each output. Under voltage lockout circuitry (UVLO) prevents the high side source driver from conducting until there is sufficient supply voltage. The outputs are held low if the logic inputs are floating. These devices, offered in an 8-pin SOIC package and in an 8-pin Power SOIC package with an exposed metal back, are fully qualified for automotive use per requirements of AEC Q100. The IXDD604SI & SIA / IXDF604SI & SIA / IXDI604SI & SIA / IXDN604SI & SIA dual high-speed gate drivers are especially well suited for driving the latest IXYS MOSFETs and IGBTs. Each of the two outputs can source and sink 4A of peak current while producing voltage rise and fall times of less than 10ns. The input of each driver is virtually immune to latch up, and proprietary circuitry eliminates cross conduction and current “shoot-through.” Low propagation delay and fast, matched rise and fall times make these devices ideal for high-frequency and high-power applications. The IXDD604SI&SIA are dual non-inverting drivers with enables; the IXDF604SI&SIA has one inverting driver and one non-inverting driver; the IXDI604SI&SIA are dual inverting drivers; and the IXDN604SI&SIA are dual non-inverting drivers. These devices, in an 8-pin Power SOIC package with an exposed metal back, are fully qualified for automotive use per requirements of AEC Q100. The IXDD609SI / IXDI609SI / IXDN609SI high-speed gate drivers are especially well suited for driving the latest IXYS MOSFETs and IGBTs. The IXD_609SI high-current output can source and sink 9A of peak current while producing voltage rise and fall times of less than 25ns. The input is CMOS compatible, and is virtually immune to latch up. Proprietary circuitry eliminates cross-conduction and current “shoot-through.” Low propagation delay and fast, matched rise and fall times make the IXD_609SI family ideal for high-frequency and high-power applications. The IXDD609SI is configured as a non-inverting driver with an enable, the IXDI609SI is configured as an inverting driver, and the IXDN609SI is configured as a non-inverting driver. The IXDD614SI / IXDI614SI / IXDN614SI high-speed gate drivers are especially well suited for driving the latest IXYS MOSFETs and IGBTs. The IXD_614SI high-current output can source and sink 14A of peak current while producing voltage rise and fall times of less than 35ns. The input is CMOS compatible, and is virtually immune to latch up. Proprietary circuitry eliminates cross-conduction and current “shoot-through.” Low propagation delay and fast, matched rise and fall times make the IXD_614SI family ideal for high-frequency and high-power applications. The IXDD614SI is configured as a non-inverting driver with an enable, the IXDI614SI is configured as an inverting driver, and the IXDN614SI is configured as a non-inverting driver.